Tennessee State Parks turn 75. They are free, packed with activities and are among my favorite places to visit. You don't have to take my sole opinion.If you haven't been to one of the parks lately, then you are missing out. Tennessee State Parks were dubbed the 'Best in the U.S. and with good reason. Not only are the parks free but most residents live within a one hour drive. There are going to be lots of special events as Tennessee State Parks celebrates the 75th Anniversary. We are also in the middle of recognizing the Civil War 150th Anniversary. Parks that are close in proximity may each n have events happening on the same weekend. This overlap can be an added incentive to get out and enjoy any of the Tennessee State Parks. Hubby was ready to leave immediately when he got word that the spillgates were open at the top of Norris Dam. This state park is in Lake City. It's off of I-75 about 45 minutes north of Knoxville. The open spillways added excitement. People came from far and wide to see the spectacle. Because of this, I heard many stories about Tennessee State Parks and about Norris Dam that were new to me. There were tall tales and short tales but none were boring. One of my favorite experiences was a trip to Sycamore Shoals last spring. I was getting out of the car when a thundering 'boom' shook the air. This was almost immediately followed by a second boom. That's when we realized that a reenactment was going on and hurried to catch the rest of the living history lesson. 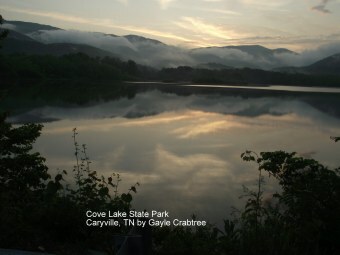 Then there the awe inspiring side the day that storm clouds rolled over Cove Lake State Park in Caryville. Despite the ferocious looking sky, the incredible force of nature was held back to a short lived rainstorm. Beautiful and unpredictable, it was just one of the days that just made me glad to be at one of the Tennessee State Parks.